Summer is still a few months away, but it's already guaranteed to be a hot one for rock fans. 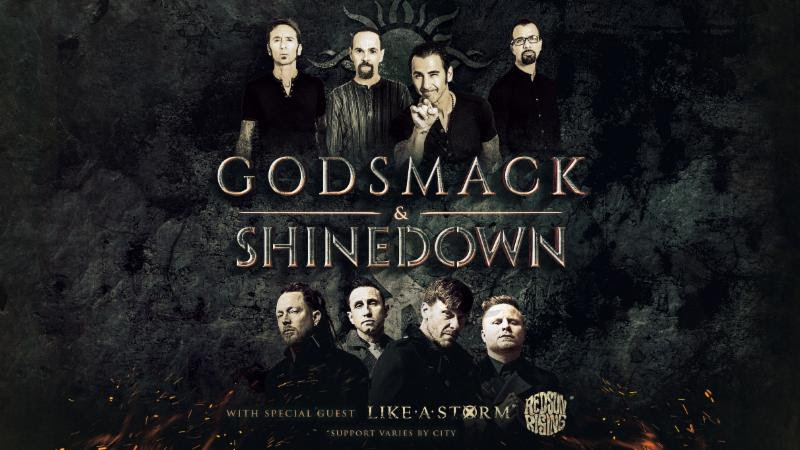 Godsmack and Shinedown are touring together for six weeks, including a stop in Atlanta on August 16. The tour comes as the multi-platinum groups prepare to release new albums later this spring. Godsmack drops "When Legends Rise" on April 27 via BMG. "Attention Attention" by Shinedown comes out May 4 on Atlantic Records. "Devil" and "Bulletproof", the lead singles from both respective albums, are already racking up the views on YouTube. Godsmack vocalist Sully Erna describes both "Bulletproof" and the entire new album as evolving while maintaining the sound fans know and love. "I wanted to stretch my wings out even further to use all the experiences I've had with writing different types of music over the years and applying that to find a way to introduce a newer, fresher, more mature sound, but still maintaining the power of Godsmack," Erna said. "We really believe this could be a great moment in our band's career and we plan on running on the road until at least fall of 2019." Looking ahead to the summer tour, Shinedown lead singer Brent Smith said, "We are creating a show for the fans that is powerful, passionate and sonicly inspiring. The audience has given us a platform to be ourselves, and create something spectacular. "Shinedown and Godsmack will most certainly not let them down." Tickets go on sale to the general public starting Friday, March 23 at LiveNation.com.